Small, unexpected gifts have a greater impact than large, expected ones. An old retailer once told me, “I used to get a budgeted $.50 an hour raise for my people each year. I spread it out in $.10 and $.15 increments over the year when they did good work.” It’s no wonder he was their favorite. Ride in a convertible on a sunny spring day. An open sunroof and rolled down windows just aren’t the same thing. Let an aggressive email response age for a bit before sending. If you’re still outraged seven hours later, let ‘er rip. Caveat: you need to reset the timer every time you tell someone about how pissed you are. Tell the wait staff to take their time and that you’ll let them know when you’re ready for your next course. Enjoy the company of your dining companions. Even if you miss dessert. Like you, I have a giant pile of books that I work my way through, taking little bits from each one. The pile should include more fiction, but I’m a sucker for non-fiction business books. Probably because you get the premise explained in the first sixty pages and you can dump the rest if it doesn’t keep your attention. 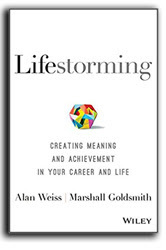 One book I read to the end is Lifestorming, from Alan Weiss and Marshall Goldsmith. The reason is because of the book jacket’s promise, “Lifestorming is your practical handbook for becoming the person you want to be!” Well, who wouldn’t want that? What I found was a guide for keeping yourself on track on your journey to becoming the person you want to be. Challenging and practical advice around handling your friends, your beliefs, and dealing with guilt. What I didn’t find was a guide for defining who you want to be. The hardest part of becoming who you want to be is deciding who you want to be, right? So, I reread it, looking for the answer to that question. And it’s right in front. Who you want to be isn’t a static thing, it’s a moving target. If the past is clear because it’s static, the future will always change as a result of each step we take. Have an idea of who you want to be, don’t get thrown off course, but know that your idea of who you want to be will change along the journey. 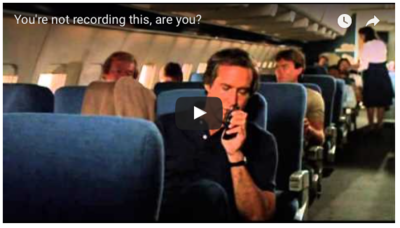 Alexa, you’re not recording this, are you? I watched Mark Hurst’s Skeptech Wednesday night and it was alternately disturbing and enlightening. Coupled with the Lifestorming book, it reinforces the idea that if you’re not clear about what you want to do, someone else will be. In this case it’s Silicon Valley teaming up with Madison Avenue and Hollywood to get us doing what we didn’t set out to do. It made me kind of sad as I trudged upstairs to change my clothes. Walking past my boys room, I stopped to take in the unholy mess spread across all horizontal surfaces. I wonder if the robots will be any better at getting them to pick up their clothes?